A property totaling nearly 180 acres in Lake Wylie is up for rezoning, and if the county approves, 178 new homes would be built on this land located between Three Points and the Pole Branch intersection at 457 Highway 274 along Mill Creek. The current zoning of the property does not allow for apartments and only permits one home unit per lot “not on less than an acre each and the total site can’t exceed a two acre per unit average.” The potential rezoning, which will not be confirmed until mid July at the earliest, would only alter the rules pertaining to lot size, and would not “limit how many homes can be built by acreage.” The goal of the rezoning is to build up the neighborhood and to expand the growth there. The new community of homes plans to showcase and amenity area that would be facing the lake. Plus, residents could take full advantage of all of the perks of living in Lake Wylie, with endless recreation and easy access to all the area’s conveniences, as well as a simple commute to the big city of Charlotte. 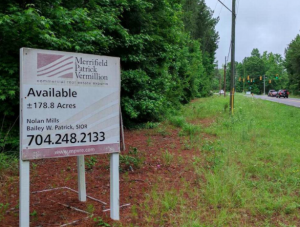 For more details and information on this possible rezoning that would lead to a large residential development, as well as what it would mean for one of the busiest intersections in the Lake Wylie area, be sure to read the full article at Heraldonline.com.